Despite modern technology and the focus on international business striving to make the world a smaller place, many organizations still struggle with the need for diversity and multiculturalism. This issue is also present in academia, as women of color and those previously perceived to be in the ethnic minority continue the journey to become the educators and leaders that universities need. 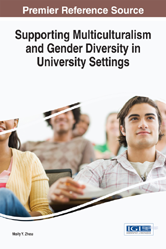 Supporting Multiculturalism and Gender Diversity in University Settings examines the experiences of some of these female leaders and what they learned in their rise through education and academia. Highlighting stories of feminism, race, and what it means to use these life lessons in the classroom, this book is a valuable resource for higher education administrators, policymakers, and women professionals everywhere.